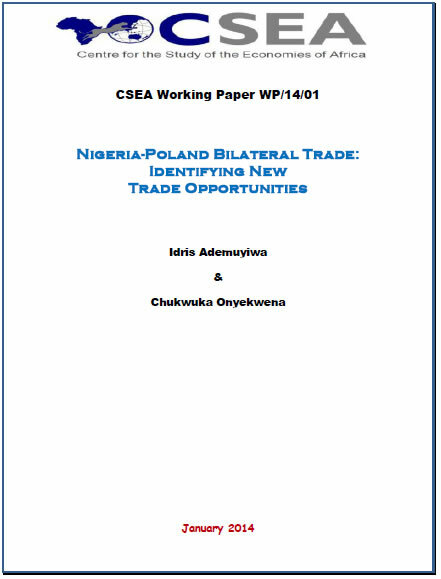 This paper examines the bilateral trade relationship between Nigeria andPoland for the period 1995 to 2012. It uses the Decision Support Model (DSM)and the Growth Identification and Facilitation Framework (GIFF) to identifymarket for Nigerian exports in Poland. The import and export indicators reveal low trade intensities between the twocountries as well as weak complementarity between Polands importdemand and Nigerias export supply. There is also evidence of rising growth inthe demand for products in which Nigeria has actual and potential exportcapacity. In addition, Nigeria faces relatively lower tariffs on Polands topimports while the cost of transportation and logistics associated with tradingwith Poland is lower than those of Nigerias current major export partners suchas India and Brazil. Furthermore, the paper identifies enormous unexploited market opportunitiesavailable to Nigeria for trading with Poland and therefore recommends that,in its quest for industrialization, the Nigerian government should support itsprivate sector to take advantage of this opportunity. Recently released labour force report by the NBS shows a quarter-over-quarter increase in Nigerias working age and labour force population. Working population rose from 110.29 million in 2017Q2, to 111.13 million persons in 2017Q32. The working age population in 2017Q3 constituted 85.08 million persons in the labour force (an increase from 83.94 million), of which 40 percent were either unemployed or underemployed. Thus, total employed persons in the quarter reached 69.1 million.